A cast stone fireplace mantel that is regal and simple all at the same time. Leon can be made to custom dimensions. French style with paneled corbels that can be made non-paneled. The tall shelf adds to its unique style. Lead time is around 3 weeks as pictured. Leon can be made from limestone or sandstone. Since our cast stone is made up of limestone the look would be very similar. Below are the dimensions that this fireplace is typically made in. Custom sizing is an option. Fireplace surround installation is provided in certain states. 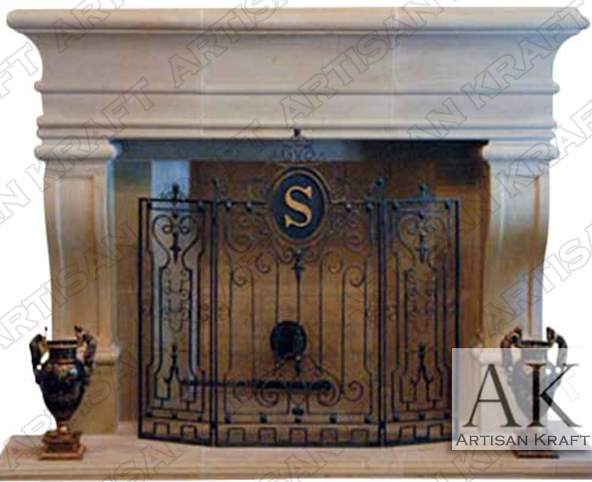 Versions of this cast stone fireplace can be viewed in our Chicago showroom. New York and Los Angeles showrooms will be setup in the near future.